Free Script: 3D Pre-Compose + Tutorial! I finally got tired of doing this manually, so we created a free script! What is this script for? 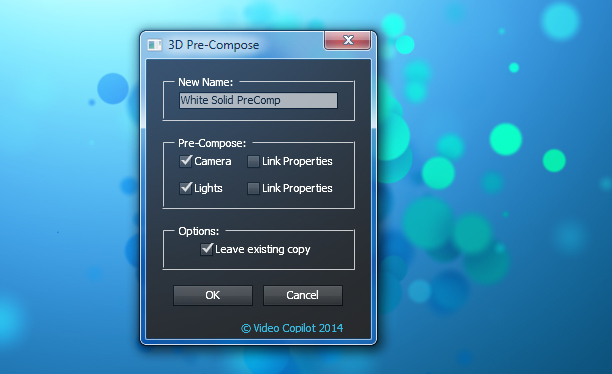 The 3D Pre-Compose Script makes it easy to pre-compose 3D-aware layers by automatically copying all cameras & lights into the new comp with linked expressions! Just watch the tutorial to see all the amazing possibilities! Plus it’s Free! Super thanks! This saved me on a project I'm currently working on!!!! I got it to work using my own manual method. You'll have to go in and add your own expressions... customize your variables "main comp" "Camera 1" with your layer/comp names of the one camera you'll be editing. I went in and deleted line 75 section and following. No error, but it doesn't work. however, it doesn't work in the project I currently work on :/ it says error at line 75.. any suggestion? Amazing! Just purchased a template of a table with photos for AE, but realized that the table was MOV file with tracked photos placements and not a 3D layer. VC and Kramer are why the businesses that hire me think I know what I'm doing! Thanks guys. I know this is an old thread but maybe someone can help me. I've downloaded the script, but when I go to FILE > SCRIPTS> the options that pop up (run script, open script editor, list of installed scripts, etc.) are darkened/un-selectible. I'm still working with CS 5.5 and my OS X is Mavericks. I know that in some ways AE 5.5 has some problems with Mavericks (e.g. the color picker will crash AE) so maybe that is the issue. Surprising to say, seeing the field I'm working in, I'm pretty computer ignorant. Anything might help. presently these vid lesson are filtered from playing .. Thanks, I have to precompose 116 layer from C4D and the interface disappear after 1 precompose any suggestion ? Hey, could someone help please? How do I get the sound/audio to work? I don't have any sound like he does..
i hope one day became someone like you are, greetings from CUBA. I got the same error. Unable to execute script at line 75. Object is invalid. It seems to be a different error than the one others mention because of a camera linked to a null. how to release helicopter model Pack? I'm a little disappointing. I asked a question regarding Mario's post above. I was having the exact same problem and wrote the question out twice. Twice it was deleted.....that surprises my guys especially when there is more than one person with the issue. I had it too and found out it was because my cameras were parented to null objects... if you can unparent them the script will work like a charm. Xav, thanks so much for writing your findings on this. Was scratching my head as to why it kept crashing. I need help, my problem is not with lights or camera but the 3d layers going flat when i pre compose them. I used a script called dojo extruder which makes 3d from a pseudo effect but when I pre compose it makes it into a flat layer. How do I fix this? Oh my God this is so useful!!! Thank you! incredible! simple and useful at the same time! thank you! You are really Awesome Andrew!!! could you please make a tutorial on, how to build this type of plugin ( .jsx or .aep) from scratch? "After effects warning:undo group mismatch,will attempt to fix"
"After effects can't continue: damaged item .. ( 26::132 )"
"Unable to execute script at line 105. After effects can't continue: dameged item"
Mee too! Can�t make use of your great script in combination with malty simple camera rig. Would be perfect to get a working combination like it�s established between simple camera rig and sure target. This would be really, really awsome !!!! Let me know what you think of my new short skit! Unfortunately this script is crashing on AE CC OSX... Can't wait for it to be fixed!! thanks! Thanks Andrew it's AWESOME u are simply the best !! With the arriving of OCTANE on After Affets, i can imagine the improvement of your tools, especially Element3D ! ! 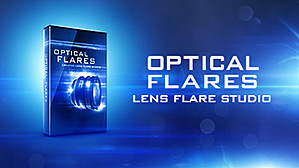 Please Andrew can show us how to create Light Flares coming out from F-35 passing by fastly. I mean anyone can make this thing but i am talking about stuff like star trek into darkness like wooooosshh and bam the magic and details. I think i found a bug. If the camere connected a 3D null object, then 3d pre comp gives an error if you use it. I just tried it on element 3d. I don't know maybe only i getting that error. Thanks for the scpirt. I created a new comp, made a new layer, added Element 3D to this layer, dropped a random 3D object, went back out and created a camera, made a null object layer, parented the camera to the null object, added the new 3D Pre-comp script to the element layer and got a fatal error. Did I do something wrong, or is this an error that needs a fix? Can't you do this natively by just clicking the collapse transformation button on your precomp? 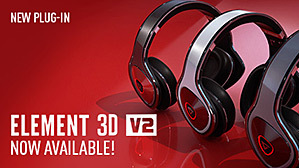 Very handy for adding effects to 3D pre's though. Little sun shaped button next to the Shy Guy. Keep yourself calm, forever with these great scripts by VC team & think of the future date when Element 3D studio(5.0.2) will release......& Vehicle model pack too. You are the best by far Andrew! I'm gonna make you a monument someday! And thanks for reminding me that I should call Mom. He livingroom window is in that shot of NYC and the invisible headphones. I'll be sure to say hi for you. After that let me save and the software close. Hey! If you can duplicate the error, can you please contact us at support@videocopilot.net and we can take a closer look there. Thanks! I got the exact same error and checked on here before contacting VC. The project was using a E3D layer and a wall of lights like in the light array to create a back lit stage. I wanted the lights to flicker behind the instruments. Was there a resolution here or a updated script? feel free to contact me VC either here or at my email address on file. The error is identical to the above. I have the EXACT same issue with the same error message. the project is a stage with instruments, and a wall of lights behind it. I want the lights to flicker behind the drums etc. What was the resolution here, or was there an update for the script? The Error is identical. dude you don't know how much time this is going to save me!! Thank you so much!!! Cool plugin from Sir Andrew Kramer !!!!! Andrew Kramer marry me!! Nah I'm just kidding. Well, not if you would like, agree to. Then I'd be serious. #MindBlown! This is awesome, life will be so much easier now, at least the After Effects part of life :) Way back in college I was using your tutorials to do amazing things with AE that the rest of my peers thought weren't possible. Thank you for building this script, massively useful. The time it takes to link properties by hand. I know in CC you can now copy with property links option but this is neat and tidy. Thanks to you and your team! The problem of not being able to precompose 3D-items and still being able to move the camera has been bothering me for such a long time now. Thanks to whichever member(s) of the VC team who wrote this thing. You guys are genuinely awesome! Thanks for putting this together (and for giving it to us for FREE)! I few days too late for me to use this on my last short, "Amazon Dröne", but it will definitely come in handy in the future! you could place this also on the VC Website under Free Presets. Thanks. Sure I'm going to use this! I was waiting this for so long... thanks ! thank you Andrew Kramer i love this it is going to help us a lot in Uganda love this is all. I really appreciate your help and hard work...thanks.....this will save me a huge amount of time.. Thanks a lot. You have made my life so much easier and less hassle free. You guys ROCK. Weriy good job Andrew. I wish you bulid new 3d cosmic object colection ! I am sory! I wrote you with errors last time. Now I want if you make 3d cosmic object coletion like star trek Into darkkness title design ,I will be glad! Already used it for a solution. I was using a 2D solid in 3D space to 'fake' a shadow with Element, but with Depth of Field on, the solid would disappear. 3D Precompose, and disabled DoF on the precomp...and Ta-Da! Fixed. Hey Eric, noticed your comment and wanted to share something that worked for me. If your camera's DOF settings are quite high, 2D layers (in 3d space) might disappear. Decrease those settings until the layer comes back. If you need to then increase the DOF on the E3D object to make it match, go under the E3D Depth of Field settings and increase the DOF Radius Multiplier. This might be more helpful should you have multiple 2D layers. Man, oh man, oh man!!!! Only from the mind of Andrew and video copilot . Thanks buddy! you are the best!! Great work.. Great script... Is it possible to make it Dockable for easy access as a window within As. Great! Is there a keybind/shortcut, that would be really helpfull! Thanks for the script! Great 10 minutes - Thanks VCP! This is awesome! I'm working on a project right now using E3D, OF, and 3D layers with animated cameras. I've been doing it manually also by linking the cameras to get everything all gravy. This will save tons of time! Thanks so much!!! it would be very cool if you can make some other "Flight School-Tutorials" like the scene in the Video. Or a lesson how to make a own Script. That would be very nice! what an amazing script , i been thinking of something like that while i was in the middle of a project last week and you just came up with it , thank god to have you andrew ! As always. Thanks! Any chance we heard some update about ELEMENT 2? You Genius Cool I liked the effect of the sun in general everything's cool you're a real Hollywood Editor.....GOOD! Really useful plug-in Andrew! I'm sure i'll use it soon. He is not(Andrew Kramer)God, he is human being like you,he is just genius. This looks fantastic - can't wait to put it to use. very cool script! Immediately used it for our new no budget music video!